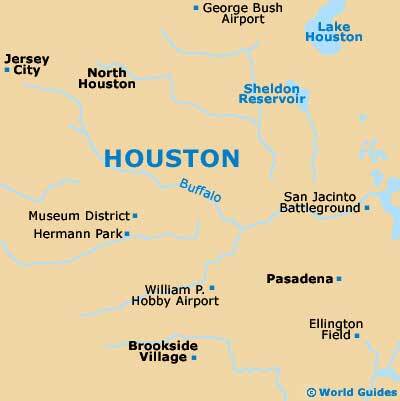 The city of Houston is located in the deep south and known as the Bayou City due to its swampy origins. 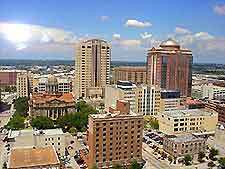 Houston is a vast metropolis situated on a flat Gulf Coast plain and boasts multiple interesting districts and neighborhoods, including a historical core where entertainment and attractions are in abundance. Houston's downtown and uptown districts are loaded with excellent and comprehensive shopping malls, quality restaurants representing all corners of the globe, some of the best theaters and museums in the country and beautiful parks and gardens. To the south of Houston's downtown district is Midtown, an interesting part of the city that can conveniently be reached from downtown via the light railway, which stops here on its way to the Medical Center. Much of Houston's Midtown area has been redeveloped since the 1990s, leaving attractive streets and squares, adorned with centennial buildings and smart shops. 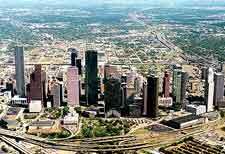 Lying in the heart of the city is downtown Houston, where business mixes with pleasure and glittering skyscrapers mark Houston's financial prominence acquired through the oil and gas business. Within this area is the 90-block historical district which is loaded with interesting old streets amid the swathe of restaurants, shops and star attractions. The Museum district in Houston is one of the largest of its kind in the US and is located just southwest of the city center near Hermann Park. There are more than a dozen high quality museums here with numerous outstanding exhibits, as well as impressive art galleries and the Houston Zoo. Houston's Theater district is one of the most established in the US, second only to New York in terms of numbers. Located in the center of downtown Houston, the Theater district covers a hefty 17-block area and features many opera, ballet and theater companies including the recent Hobby Center for the Performing Arts. Other star attractions in the Theater district include Bayou Place, with its movie theater and restaurants and the brilliant Downtown Aquarium. Situated to the northwest of Houston's downtown district, within the I-610 orbital, The Heights is a historical neighborhood dating back to the 1800s. Awash with well-preserved Victorian abodes and antique shops, plaques mark the historical parts of the area and there is also a WWII memorial. The Heights district of Houston is known for hosting many festivals throughout the year. Uptown Houston is one of the best entertainment districts in the city and is where you will find the massive, cosmopolitan Galleria shopping mall, the fifth largest in the US complete with numerous upscale stores and restaurants. The district also encompasses Houston's Richmond Entertainment district and Richmond Avenue, both of which are also known for their excellent shopping, restaurants and themed bars. The uptown district is much like downtown Houston, as it shares its lofty appearance and resident business community, but here you will also find many green areas and popular sports venues.